Evening you lovely lot, firstly cannot cope with the fact that it is March and secondly, that it's ALREADY Friday evening? How? Why is time literally flying past? ahh slow down please! I'm not complaining that it's the weekend however, and this post comes just in time for you guys to get tanned up for the weekend. I've actually been meaning to do this post for what seems like forever but trying to test out so many different self-tans and trying to find ones I actually love enough to post on the blog, takes a lot of time- a lot longer than I thought- yip, even with the amount of times I go out! This is the question I probably get asked the most as well, so I thought I would finally pop it up in a post for you all to read. Ok so, I've narrowed it down to my top five that I continue to go back to time and time again and to be honest don't think you can go wrong with any of these lot! Sometimes you aren't heading anywhere in particular or heading out at all you just like to have a nice even colour to you, just simply to make you feel better.. it has been proven than tan makes you feel 100% better about yourself, ok well, it may not be a legit fact, but to me it 100% does! Want a tan that takes two seconds to pop on, sprays out an even coverage and isn't too dark for you? This is your go to one, the spray bottle is what I find so handy about it, especially in those hard to reach places! I can use this in the morning if I am in a hurry (as always) or I can pop it on before bed at night if I want it to develop into a deeper colour! The Bellamianta range, this is my number 4. This tan only recently became noticeable to me about a year ago through Instagram, then when I had the chance to sample it out I was so excited to finally see what the fuss was all about. The best part about this tan for me is the mitt- it is hands down the best mitt I have ever used! The glove shape and velvet texture make for the most perfect seamless application every time. The lotion itself is quite hard to rub in I find, but, I just use smaller amounts at a time to help this and find it works really well. 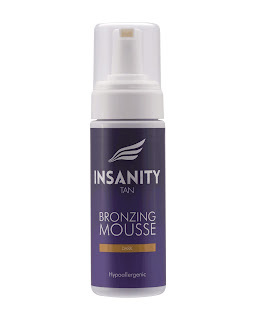 I personally find the mousse much easier to put on and the colour is a lot deeper as I love a dark tan. Like most of the tans I would use unless they are instant, I would pop this on after the shower and before bed so it has as long as possible to develop, then wash the 'top coat' off in the morning and you're left with a beautiful natural colour to the skin. Number 3 on the countdown is the cheapest on the list at just £1.19 for the bottle, the Anovia self tan moisturiser. This one I find so soft on your skin and feels just like you are putting on moisturiser, as it is full of Cocoa Butter, therefore the smell is amazing and doesn't leave you with a horrible 'tan' smell afterwards. It does say it's a 'wear off' formula but I find it washes off really easily the next day and doesn't leave any dark marks around your knees or elbows. I recently could only find this in my local pharmacy and that is the price it was there, literally a bargain! But they have actually stopped stocking it, so I've had to get it on Amazon now and it works out at roughly £5 per bottle including postage. 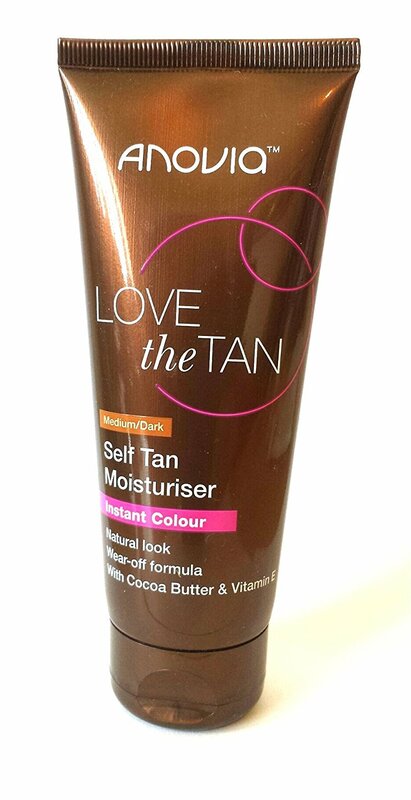 Dearer than before but still the cheapest one by far and still a bargain for the amount of full body tans you will get out of this tiny bottle! I can use this one in the morning or at night, I use it mostly in the morning if I'm in a rush to pop some colour onto me. My second choice is, the Sally Hansen spray on airbrush legs. 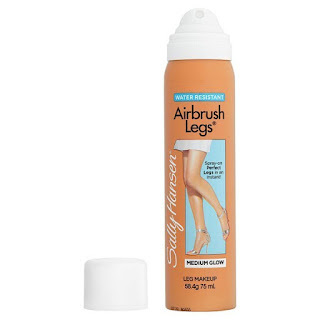 I think just about everyone either uses this or has used it at some point in their life, it does exactly what it says on the tin- gives you flawless airbrushed looking legs. It is just far too handy for last minute nights out and even everyday wear, if you don't have time to put tan on they night before. It comes in three different shades, light glow, medium glow and deep glow. If I am using it for during the day I would try and use the light coloured one as it has more of a natural look about it compared to the medium or deep coloured ones, but if I am heading out I tend to use the darker shades. It is super handy for holidays too for when you are going for dinner etc as it washes off so easy if you are like me, and do not take to the sun at all! This one lasts a life time for the size of the bottle, and it fits in your hand luggage as it is only 75ml if you are heading away anywhere. And lastly, if you guys caught it on my Snapchat recently, it is the Insanity Tan. 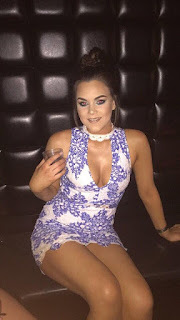 I seen this tan being used with the Miss Northern Ireland campaign and wondered what all the hype was about, when I got the chance to review it for them I was so pleased and I really wasn't disappointed either. It's another mousse formula and I have had this one for around 7 months and I just finished it during the week. They do a mitt just like the Bellamianta one in a velvet effect, and this helps the tan go on so flawlessly. It develops over a 4-8 hour period so I always pop this on before bed, so it is on for as long as possible before having to wash it off. The best bit about it- there is no smell from it, as it is fragrance-free, alcohol-free and paraben free! Even when you wash it off there is still a beautiful dark colour to the skin, so it isn't just one or two days. I usually get around 5-6 days of looking like I have just stepped off a plane from the day I applied this -even in-between showering sometimes twice a day! This is currently only available to buy on their website, shop it here. This is my little 'trick' I like to do before I go out, no matter what tan I have on I always spray a 'top coat' as I like to call it over my body. This is the Sally Hansen in medium glow, as it just fills in any patches I may have and gives that airbrush effect to my body. 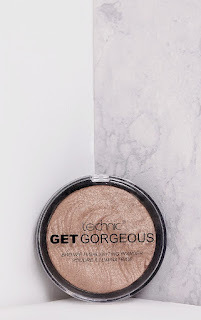 I always then pop on the Technic Highlighter on my collar bones, shins and shoulders, this is what gives the glow effect you lovely lot always say I have on a night out! Thanks for reading girlies, have a good weekend and happy tanning!